He cannot tell a lie - but he can make some pretty funny faces. 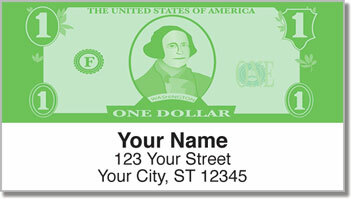 This light-hearted return address label design features our first president showing a sense of humor. While you'd never guess it from looking at presidential portraits of George Washington, historians say he was probably a pretty funny guy. It's just that biographers of his era tried to hide this fact in order to make him seem serious and superior. In fact, it's believe Martha Washington burned his letters for that very reason. Yet stories still exist of Washington actually rolling on the ground in laughter! This is a unique way to mark your mail with something that will make folks chuckle! Plus, the self-adhesive backing on your new labels will make it easy to prepare outgoing mail. Get your own By George Address Labels today! Complete the order with matching checks.